Shaving is one of the essential parts of every man’s grooming. It has been done over millennia, up to a point where it became almost mandatory in some establishments. To the man who is passionate about his grooming, and with a sense of style and prestige on top of it, a shaving brush will most definitely hold an integral position on his grooming spot. Shaving brushes, as with all other grooming items, come in different varieties. These will differ according to the manufacturers, the hairs used and the handles. However, there are general features that every good quality shaving brush should have, and these are outlined below. Tips for Choosing the Best Shaving Brush. 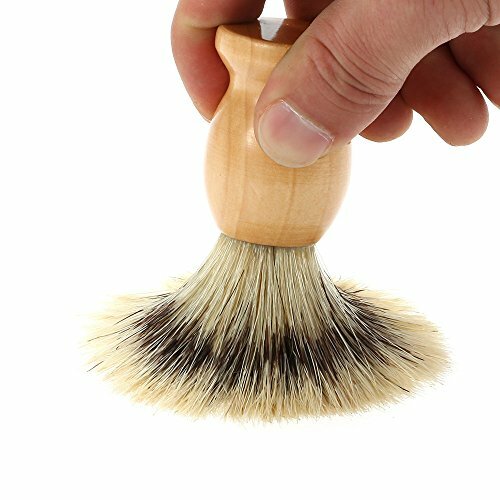 The shaving brush should have soft tips that will be comfortable. They should be firm. Sometimes referred to as having a ‘backbone,’ this prevents the brush from collapsing on the skin and gives the feeling of being massaged as you apply the lather. The brush needs to have good lather flow-through. Put simply, it should be able to hold up enough lather for a full application and at the same time release it quickly to the skin. The best shaving brush should always have this. It should have a comfortable handle. There is a wide variety of shaving brushes available in the market. We have reviewed some of the highest rated models in this article to help you find the best shaving brush for your own needs. Reviews of the Ten Best Shaving Brushes. 1. Docooler Bristle Shaving Brush. The Docooler shaving brush is designed for the stylish man. With ultra soft bristles made of animal hair for comfort and a wooden handle, you will be looking forward to the next shave with this item. It is a lightweight brush that can be easily carried along when traveling.The bristles are soft to avoid irritating your skin, and are well knotted for the ‘backbone’ feel and durability. It also dries fast which is important for hygiene. 2. 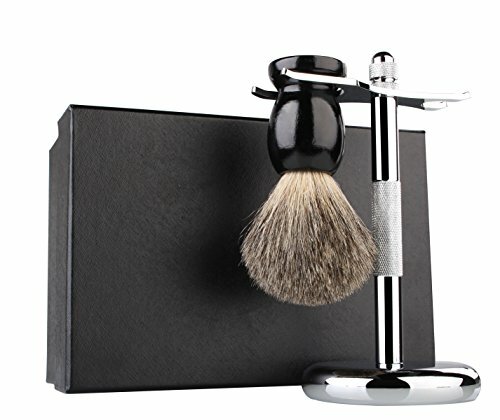 Usnaturals Badger Hair Shaving Brush and Chrome Razor Stand Shaving Set. It is made from pure badger hair with a wooden handle, meaning this brush provides a rich lather and minimal hair entanglement. The bristles are well spread out at the base for a good spread while the strong knotted ‘backbone’ ensures bristle stability for easier application. It comes with a chrome plated stand that has a rubber-like non-slip base for stability. The stand helps keep the brush dry and well aired when not in use, which prevents bacteria growth. It is imperative to note that the chrome-plated stand is designed to last, and will serve you for long even in the most steamy of bathrooms. The badger hair used in making this brush has been sanitized, so you will not have to worry about skin pore infections. 3. Parker Safety Razor Silvertip Badger Bristle Shaving Brush. For the man who is looking for prestige coupled with finesse and excellent performance, this brush is worth consideration. It is made from high-grade silvertip badger bristles, which means it is designed to generate a warm and full lather. Apart from having the best badger hairs available, this brush is entirely handmade, and they have ensured that the bristle density is just right for water retention and stability. The handle is a high-class faux horn. You will get the greatest feeling of comfort with this brush, and a touch of finesse and class. It even comes with a drip stand to ensure that it stays dry and well aired when not in use. 4. 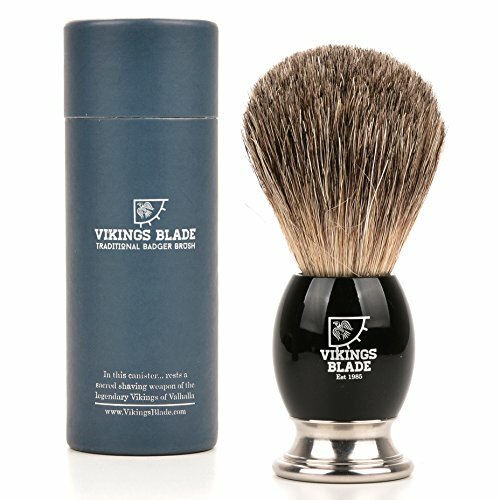 Vikings Blade Luxury Badger Brush. Once again, prestige couples with style and durability in this brush from Vikings. It sports pure badger hair bristles that are well knotted and spread out at the base. It is this design that gives a full lather and a massaging feel. The handle is made of heavyweight acrylic and comes with a choice of three colors. It has a sturdy base made of Swedish alloy for durability. It is a brush that will keep for long while offering exceptional quality. It really is one of the best shaving brushes of its type. 5. 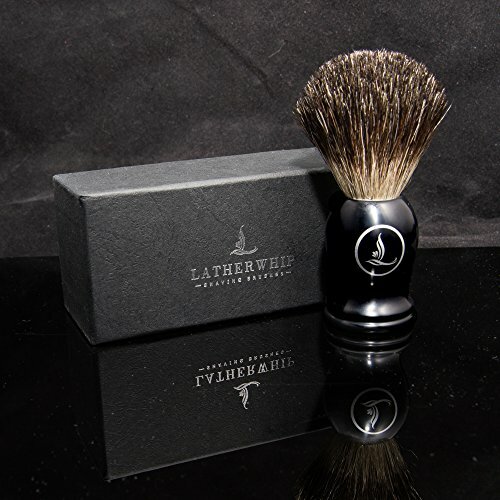 Latherwhip Badger Hair Shaving Brush. The Latherwhip shaving brush is a stylish combination of perfection and prestige. The bristles are made of pure badger hair that is well-knotted for maximum durability and the ‘backbone’ feel. They are designed to hold up the heat for more efficient lathering. The soft feel bristles are perfect for a soft and comfortable wet shave, and they dry out quickly. The handle is made of resin, which is scratch resistant and will last you for long. 6. 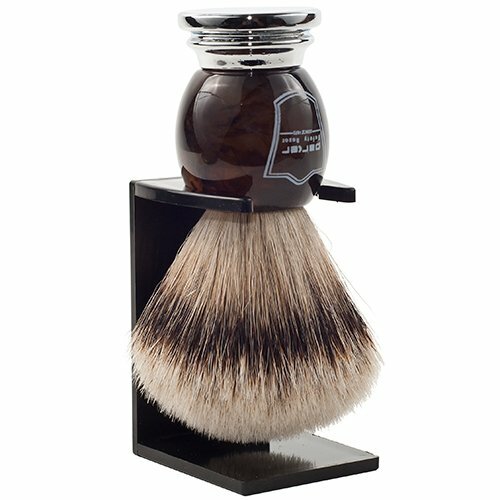 Miusco Badger Hair Shaving Brush and Chrome Stand. 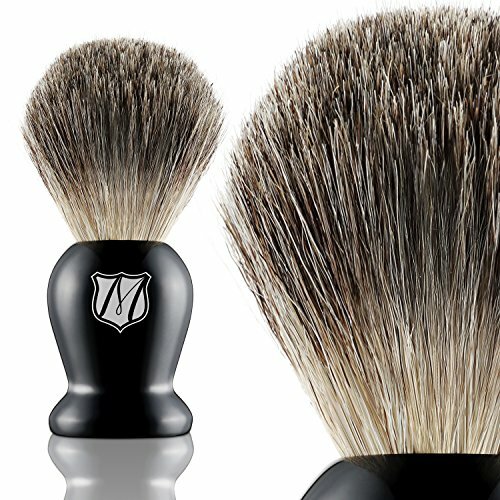 If you are one for elegant simplicity and also finesse, this shaving brush from Miusco could be for you. It comes with a wooden handle that is simple yet elegant, and 100 percent badger hair that will provide your face with a comfortable massage feel and will exfoliate the skin. It also comes with a shaving stand that will keep your brush dry and well aerated, actually reducing the chances of bacterial growth and subsequent infection. They have put a screw in the stand base so that you can tighten it to your liking for stability. The badger hair used is thoroughly sanitized, a plus for the hygiene considerations. 7. 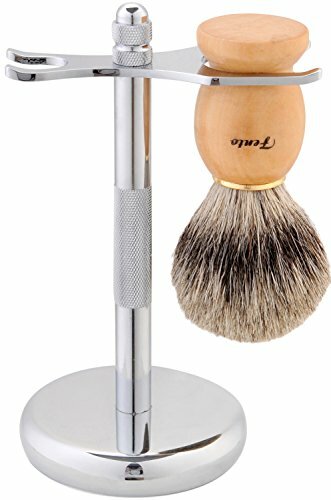 Fento Badger Hair Shaving Brush and Chrome Razor Stand Shaving Set. The Fento shaving brush is well designed and styled to fit your shaving needs perfectly. It is made from 100 percent badger hair that is ingeniously knotted to prevent fall outs and provide a stable massage feel during your grooming session. The bristles spread out towards the base for a wider application, and they create a warm and rich lather. With the soft touch, chances of scratchiness and skin irritation are almost nil. quality service over an extended period of time. 8. Escali Pure Badger Shaving Brush. 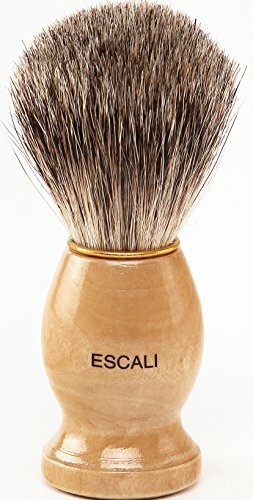 The Escali shaving brush is designed to achieve a soft and luxurious grooming experience. This shaving brush is made of pure badger hair that is well knotted for a firm, balanced feel. At the same time it gently spreads out at the base to give the best lather. The hairs are designed to efficiently whip up a thick, foamy lather that is sufficient for a one-time application. This means with one sweep across the face you are ready for the best shave. The manufacturer has emphasized on a design that will retain just enough water for your shave while making the brush incredibly easy to rinse. These hygienic considerations have contributed to the popularity of this product hence its high rating as one of the best shaving brushes. The badger hairs will gently lift the hairs on your face while giving a soft massage feeling and gently exfoliating your skin pores. You will be assured that this brush will last for a long time while maintaining the great feel since the manufacturer created it with a sturdy wooden handle that is durable and with a touch of finesse. 9. 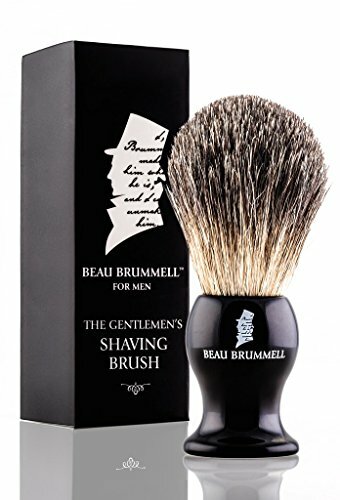 Beau Brummell Shaving Brush. 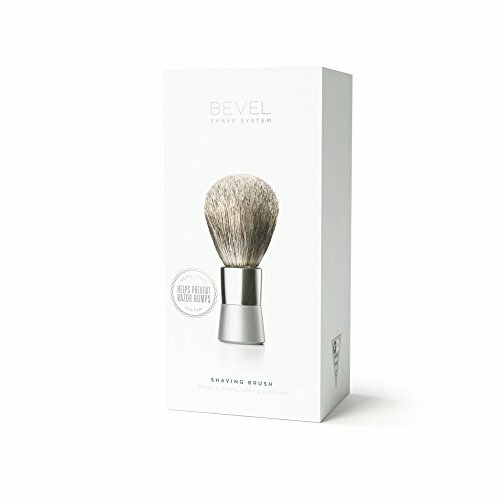 It is made from 100 percent pure badger hair, and this shaving brush is designed to offer you the greatest shaving experience of a lifetime. The black badger hairs are soft and well spread for easy lathering and application, while the ingenious knotting gives them a sturdy feel when working. The brush is great for exfoliation and gently lifts your facial hairs for easy shaving. Adding to the style and elegance, the brush has been fitted with a sturdy handle made from ergonomic resin that provides a sure grip and does not absorb water over time. It is a plus for durability and hygiene, coupled with the easy to dry bristles that are well spread out for aeration. The triple action functional design of this shaving brush is key to its high rating. It has been intended to offer a close, comfortable shave with gentle skin exfoliation and a well-spread lather application. The pure badger hair bristles are tightly knotted to provide a sturdy backbone during use, while they gently spread out at the base for a massaging feel and all round full lather application. It is fitted with a stylish, durable handle that gives you the grip necessary for a great shave, and is easy to rinse and dry for hygiene. With seemingly endless varieties of shaving brushes available on the market, you will find some of the best features that are essential for the best shaving brush in this review. That will help you make an informed choice for your shaving needs.